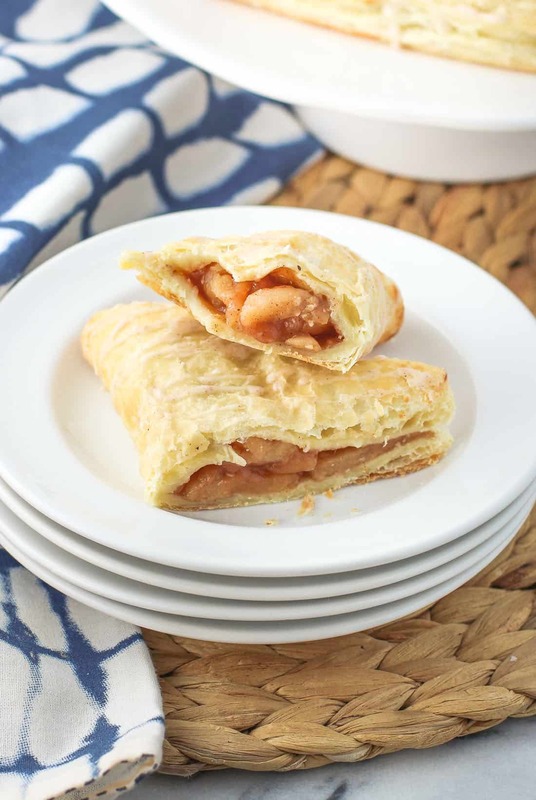 Easy puff pastry apple turnovers are bursting with apple pie flavor, with a filling that can be prepared a variety of different ways. A simple drizzle of glaze flavored with apple pie spice is all you need as a finishing touch on these flaky, fruit-filled pastries. After kicking off apple season with (mostly) slow cooker apple pie, I’m keeping it going with these puff pastry apple turnovers. The whole fruit and pastry combo has a knack for being breakfast-permissible, so basically once that criterion is met, I’m declaring these as an any-time-of-the-day type of food. At least that’s what I’m telling myself on the occasions when I take a bite or two some time between breakfast and lunch. Before we get to the filling options, let’s discuss the pastry piece. Despite baking with it numerous times, I’m still in a state of wonderment when I use puff pastry. Now I’m not sure why, as it’s never not puffed on me or been a fail in any way, but something with the way it’s SO easy to use juxtaposed with how not easy the end result appears freaks my brain out a little. A good, mini freak out. Now that we’ve got the pastry figured out, we’re onto the filling. I’ve made turnovers multiple times, but I specifically made these apple turnovers a few different ways recently. 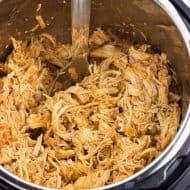 The first time was when I had leftover, absolutely delicious, apple pie filling made in the slow cooker. It worked just great! But I know everyone doesn’t have three-ish hours to prepare apple pie filling in the slow cooker. 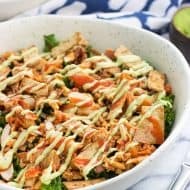 So I made a stovetop version that cooks for only about twenty minutes or so. Both batches of apple filling are awesome for using in these turnovers. They’re not too ‘goopy’ and bring all the flavor as far as apple pie spice is concerned. You can follow the instructions in the recipe below to make your own stovetop apple pie filling in about 20 minutes. If you’re not in a rush and/or you’d like your apple pie filling to have as little hands-on time as possible, you can use 1 cup of the apple mixture from my (mostly) slow cooker apple pie recipe. Note that you’ll have a lot more filling than needed for one batch of these turnovers. I’ve done this before with those leftover apples and it was AH-MAZING. The filling in this way would take about 3 hours, with a little time for it to cool. We all know life gets busy, so store-bought apple pie filling is always an option. Whichever way you pick, you’ll have yourself a flaky and deliciously-glazed pastry filled with warmly-spiced and tender (**but not mushy**) apples. What’s not to like? Peel and slice apples about 1/4" thin and add them to a medium saucepan. Add lemon juice, brown sugar, cornstarch, cinnamon, nutmeg, allspice, cardamom, and water and stir to evenly coat apple slices. Set saucepan over low-medium heat and cover. Let heat for 15-20 minutes, stirring occasionally, as the apples soften the mixture thickens and becomes gooey. Remove from heat and let cool before proceeding. Place the sheet of puff pastry onto a lightly floured surface. Flour a rolling pin and roll out the puff pastry into a square shape until it's approximately 12-13 inches long on all sides. Using a pastry or a pizza wheel, cut the sheet into four equal squares. Scoop about 1/4 cup of apple pie filling onto each square and situate it onto one diagonal half of the square, leaving about 1/2" of space around the edges. Using your finger or a pastry brush, very lightly wet the edges that you'll be sealing with water to help them stick. Fold each square in half over the filling, and press the edges to seal. I went back over the edges and pressed with the tines of a fork to crimp them. Bake turnovers for 15 or so minutes, or until they have puffed up and become golden. Let cool on the baking sheet for a few minutes, and then carefully transfer to a wire rack to cool completely. Whisk together confectioners' sugar and apple pie spice in a bowl. Slowly add water until the glaze is pourable but is still thick enough to maintain a drizzle shape. If you've added too much water, add a little bit extra confectioners' sugar until the consistency is to your liking. 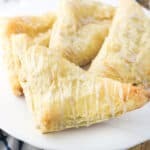 Drizzle glaze onto completely cooled turnovers and let set. 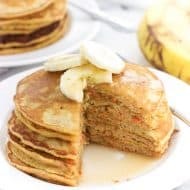 **You will have about 3/4 cup of leftover apple filling. 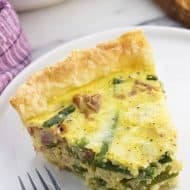 You can make more than four turnovers, or use it to top pancakes/waffles, yogurt, ice cream, etc. I like to use Gala, Ambrosia, or Honeycrisp apples when making apple pie filling, but you can use one or more of your preferred varieties. 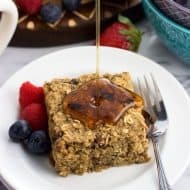 These were delicious and easy to make! Yum! Thumbs up. 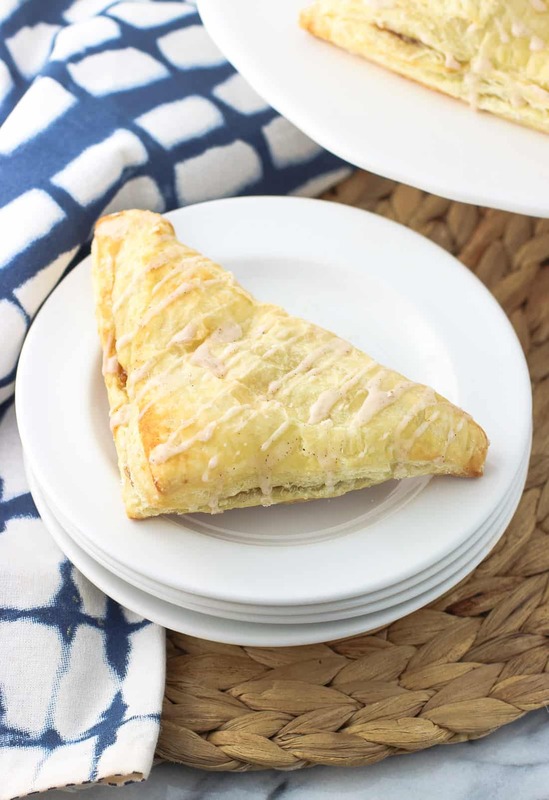 I love apple turnovers and these look even better than the store-bought variety. Plus you can eat them warm which would be tops in my book. I’m with you on puff pastry sheets – they’re amazing and always turn out delicious. I like the way you broke it out for options on the apple filling too. 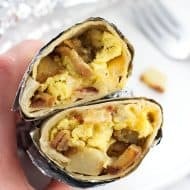 Love the spices used in the filling. 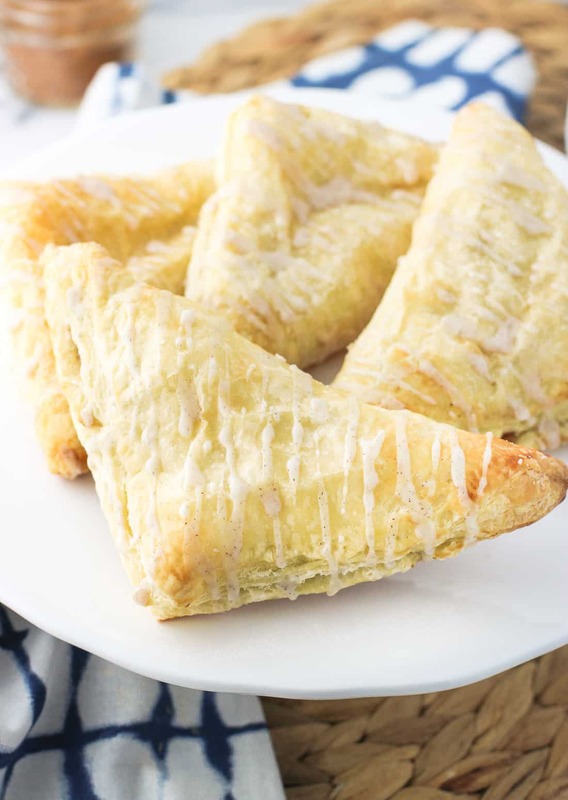 Getting ready for fall with your turnovers.